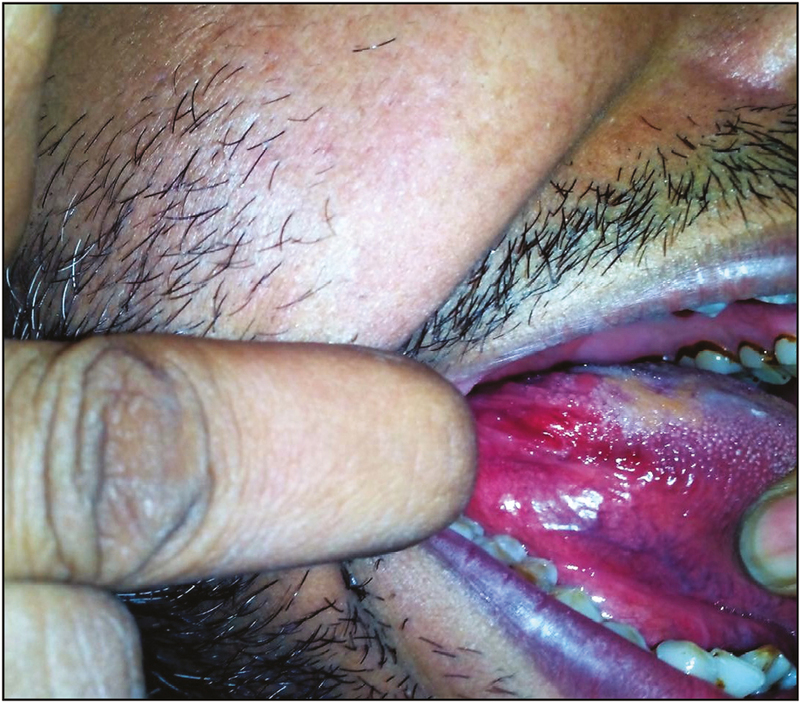 A young otherwise healthy male presented with asymptomatic pinkish-red nodule over postero-lateral tongue with the suspicion of having developed oral cancer. Biopsy from the lesion showed multiple circumscribed nodules in the lamina propria comprised of numerous oval and spindle-shaped cells. Abundant lymphatic tissue with germinal centres were also observed. Differentials included mucosal neuroma, traumatic neuroma, subgemmal neurogenous plaque, neurofibroma, and lingual tonsils. This quiz discusses the diagnosis and approach to the differential diagnoses in such a clinical setting. A 28-year-old man presented with otherwise completely asymptomatic fleshy swelling over the posterolateral surface of right side of tongue for 6 months. Bruxism and tongue bite were ruled out on questioning. He denied addictions such as chewing of betel nut/tobacco and smoking. No systemic complaints were reported. Despite lack of symptoms, the patient was anxious about the lesion being oral cancer. Intraoral examination revealed an oval nodular swelling of 1×2cm size in the foliate papillae of the right posterolateral tongue. The pinkish-red nodule was firm, non-tender, and had subtle transverse grooves and superficial erosion over the surface [Figure 1]. Dental history was noncontributory and cervical lymphadenopathy was absent. Histopathology showed numerous oval and spindle-shaped cells in the lamina propria arranged as circumscribed nodules. Within the circumscribed neural plexus, the deepest portion showed small nerve fascicles and the superficial portion revealed linear bundles of spindle cells interspersed with thin fibrillary collagen fibers. Abundant lymphatic tissue with germinal centers was conspicuous [Figure 2] and [Figure 3]. Neurofibroma, traumatic neuroma, and mucosal neuroma are often confused on histopathology.,, Neurofibroma is usually deep seated and displays characteristic cellular arrangement in short fascicles, whorls, or storiform pattern., Clusters of ganglion cells may also be seen in a traumatic neuroma; however, the histological features that differentiate it from related differentials including SNP subsume: haphazard proliferation of prominent nerve fascicles, including axons with their investitures of myelin, Schwann cells, and fibroblasts embedded in a fibrotic stroma with focal areas of hyalinized collagen. Mucosal neuroma was the initial histopathological diagnosis reported for this patient. Oral mucosal neuromas, which are often associated with multiple endocrine neoplasia MEN2b, indeed constitute the closest histological differential of SNP. The oral lesions present tortuous bundles of nerves with a prominent perineurium within a fibrous stroma. Mature ganglion cells within enlarged lingual nerves may be rarely encountered. Patients with MEN2b with lingual mucosal neuroma(s) present with early gastrointestinal (GI) symptoms secondary to GI ganglioneuromatosis. Conclusively, the diagnosis of SNP was clinched based on the lack of symptoms, characteristic histology with prominent lymphoid proliferation, and lack of clinical and histological features typical of other differentials. Lesion excision or biopsy is usually required only in symptomatic cases to rule out neoplasia., Veritably, en bloc resection of the left posterolateral tongue had been suggested for this patient also by two oromaxillofacial surgeons. The patient was rescued opportunely from unnecessary aggressive surgery after we sorted the clinicopathologic correlation with our dermatopathologist in detail. Thus, awareness about this condition is imperative for clinicians and pathologists to avoid misdiagnosis and prevent unnecessary procedures. 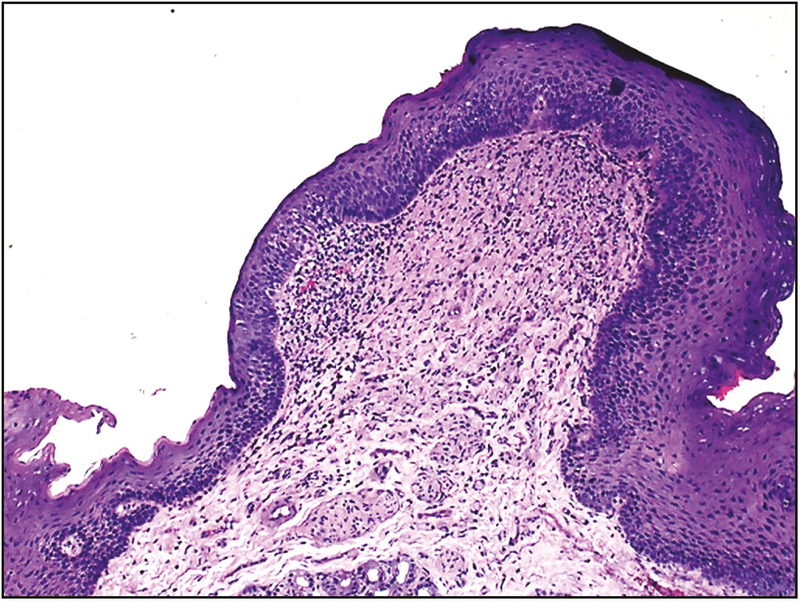 SNP typically arises in foliate papillae as an asymptomatic pinkish nodule or a frankly exophytic lesion, sometimes accompanied by trauma-induced ulceration. Histological hallmark of SNP is subepithelial proliferation of nerve plexus with aggregates of ganglion cells with a biphasic microscopic pattern comprising a circumscribed nerve plexus and spindle cells. Clinical differentials include soft tissue lesions such as inflammatory fibrous hyperplasia, fibroma, neurofibroma and mucosal neuroma, and hyperplastic lingual tonsils and lingual thyroid. 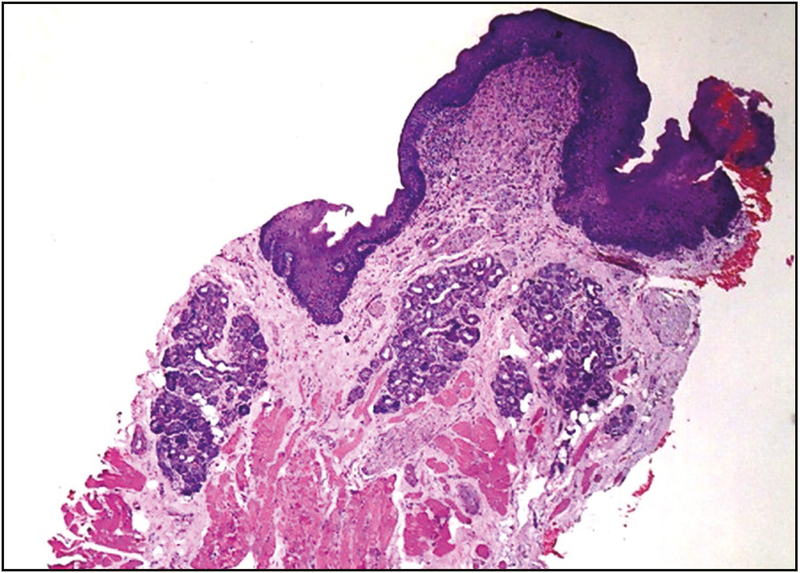 Neurofibroma, traumatic neuroma, and mucosal neuroma are often confused on histopathology because of the abundant neuronal cells. Awareness about this condition is imperative for clinicians and pathologists to avoid misdiagnosis and prevent unnecessary procedures. We thank Dr. Uday Khopkar from the Department of Skin, STD and Leprosy, Seth Gordhandas Sunderdas Medical College and the King Edward Memorial Hospital, Mumbai, Maharashtra, India for providing us with the histopathological images of the mucosal biopsy. Gonzaga AKG, Moreira DGL, Sena DAC, Lopes MLDS, de Souza LB, Queiroz LMG. Subgemmal neurogenous plaque of the tongue: a report of three cases. Oral Maxillofac Surg 2017;21:351-5. Gueiros LA, León JE, Leão JC, Lopes MA, Jorge J, de Almeida OP. Subgemmal neurogenous plaque: clinical and microscopic evaluation of 7 cases. Oral Surg Oral Med Oral Pathol Oral Radiol Endod 2009;108:920-4. Brito JA, de Souza FT, de Lacerda JC, Bernardes VF, Gomes CC, Gomez RS. Asymptomatic nodule in the tongue. Oral Surg Oral Med Oral Pathol Oral Radiol 2012;114:281-3. Triantafyllou A, Coulter P. Structural organization of subgemmal neurogenous plaques in foliate papillae of tongue. Hum Pathol 2004;35:991-9. Val-Bernal JF, Rivadulla I, Garijo MF. Lingual subgemmal neurogenous plaques with pseudoepitheliomatous hyperplasia: incidental pseudomalignant condition. Pathol Int 2006;56:462-5. Lopes MA, Vargas PA, Almeida OP, Takahama A, León JE. Oral traumatic neuroma with mature ganglion cells: a case report and review of the literature. J Oral Maxillofac Pathol 2009;13:67-9. Qualia CM, Brown MR, Ryan CK, Rossi TM. Oral mucosal neuromas leading to the diagnosis of multiple endocrine neoplasia type 2B in a child with intestinal pseudo-obstruction. Gastroenterol Hepatol (N Y) 2007;3:208-11.